Google Maps not only gives driving directions, but it also delivers walking, biking, and public transit directions in many areas. These instructions work on any mobile device using the Google Maps app or Google Maps on the web. That includes iPhones and Android phones from companies such as Samsung, Google, Huawei, and Xiaomi. Tap Directions (on the website, this is on the upper left side of the open browser window). Select a starting point. If you're logged in to Google, you may have already designated your home or workplace, so you can select either of those locations as your starting point. If you started on your mobile device, you can choose your current location as your starting point. Otherwise, type in an address or location. Change your mode of transportation by clicking the Walking icon at the top of the left pane. By default, it is usually set to Driving, but if you use the mobile version and often go places using an alternate transportation method, it may have a different default setting for you. Sometimes you have multiple options for routes, and Google offers to give you directions for whichever one is most appealing. You can see an estimate for how long each route would take to walk. Drag along the route to adjust it if necessary. You may know the sidewalk is blocked along part of the route, or you may not feel safe walking through a particular neighborhood, You can adjust the route, and if enough people do it, Google may adjust the route for future pedestrians. Google is not always aware of road hazards such as construction zones, unsafe neighborhoods, or busy streets with inadequate lights. However, if you live in a great city for walking, the maps are usually pretty good. Walking times are estimates. Google aggregates the information by looking at average walking speeds. It may also take the elevation and grade into consideration, but if you walk slower or faster than the average walker by Google estimates, the timing will be off. 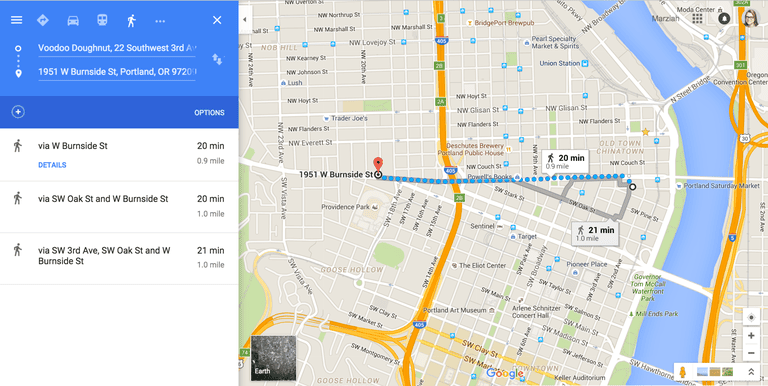 When you ask for public transportation directions, Google usually also includes some walking. That's what public transportation experts sometimes call the "last mile." Sometimes that last mile is a literal last mile, so keep an eye out for exactly which portion of your public transportation direction involves walking. If you don't want to hoof it, you can order an Uber ride directly from the app. Although Google provides biking and driving directions, there is currently no way to combine the biking, driving, and public transportation directions with Google Maps if you wanted to specify that you solve your "last mile" problem by biking to or from the bus stop. While it might be easy to dismiss this as a nonissue because the walking directions are likely overestimating the time you need to get to or from the bus stop, if you're using a different transportation method, you need different directions when you drive or bike. Pedestrians can walk in either direction on a one-way street, for example.